Thiga Safaris can provide you with low cost camping safaris to any of Kenya's safari areas, including Masai Mara, Lake Nakuru, Lake Naivasha and Amboseli. We are very proud to be Kenyan, that's where we belong (Hakuna Matata) no problem. Visit us in Kenya and we'll help you discover East Africa. 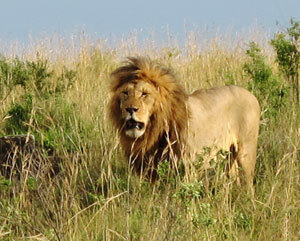 This is a short safari in the Maasai Mara National Reserve. The safari departs Nairobi in the morning and involves a drive down to the the floor of the Rift Valley, making a stop at the view point to see the escarpment and the awesome sight of the valley and its features. We'll arrive at Maasai Mara in time for lunch, followed by a late afternoon game drive that introduces you to Kenya’s most popular game sanctuary. 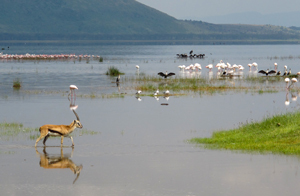 Depart from your hotel in Nairobi and drive along the floor of the Great Rift Valley. Arrive at Masai Mara Game Reserve in time for lunch. Afternoon game drive. Dinner and overnight at Mara Springs Camp. Spend the day in Masai Mara, Kenya’s most popular game sanctuary where you will have the best opportunity of spotting the Big Five – lion, leopard, buffalo, rhino and elephant. Game drives are flexible, with the option of going out with picnic lunch boxes to spend entire day in the the park, or you can choose to have early morning and late afternoon game drives. 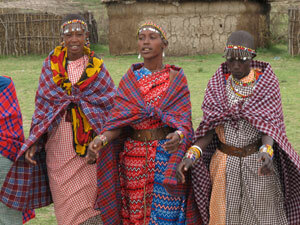 You will also have the option of visiting a local Maasai village. All meals and overnight at Mara Springs Camp. Adding to two memorable days at the game filled plains of the Maasai Mara Game Reserve, this safari also takes you to Lake Nakuru National Park which is one of the world’s greatest bird spectacles. Besides the varied bird population of different species and especially flamingos that carpet the lake, the park has its fair share of wildlife that include the endangered black rhino. Depart Nairobi in the morning and drive to the floor of the Rift Valley – to Masai Mara Game Reserve arriving Mara Springs Camp in time for lunch. Afternoon game drive. Dinner and overnight at the camp. Spend the day in Masai Mara, Kenya’s most popular game sanctuary where you will have the best opportunity of spotting the Big Five – lion, leopard, buffalo, rhino and elephant. You will also have the option of visiting a local Maasai village. All meals and overnight at Mara Springs Camp. Afternoon game drive. Besides the flamingos that the lake is famous for, there are approx 400 other species of birds visiting the lake. Also, many species of game can be found in the park including the introduced Rothschild’s giraffe, black and white rhino, waterbuck, reedbuck, lion, buffalo, leopard, baboon and many species of plains game. Depart Amboseli in the morning and drive via Nairobi to the floor of the Rift Valley with hot or picnic lunch en route to Lake Nakuru National Park arriving for your afternoon game drive. Besides the flamingos that the lake is famous for, there are approx 400 other species of birds visiting the lake. Also, many species of game can be found in the park including the introduced Rothschild’s giraffe, black and white rhino, waterbuck, reedbuck, lion, buffalo, leopard, baboon and many species of plains game. Dinner and overnight at WCK Guest House. Depart after breakfast and drive further along the floor of the Rift Valley to Maasai Mara Game Reserve arriving Mara Springs Camp in time for lunch. Afternoon game drive that introduces to this vast game filled reserve. Dinner and overnight at the lodge. Spend the day in Maasai Mara, Kenya’s most popular game sanctuary where you will have the best opportunity of spotting the Big Five (lion, leopard, buffalo, rhino and elephant). Morning and afternoon game drives with the option of visiting a local Maasai village. All meals and overnight at Mara Springs Camp. After breakfast drive back to Nairobi arriving approx 13:00 hrs. Drop off at your hotel or transfer to the airport for your onward flight home. End of services.